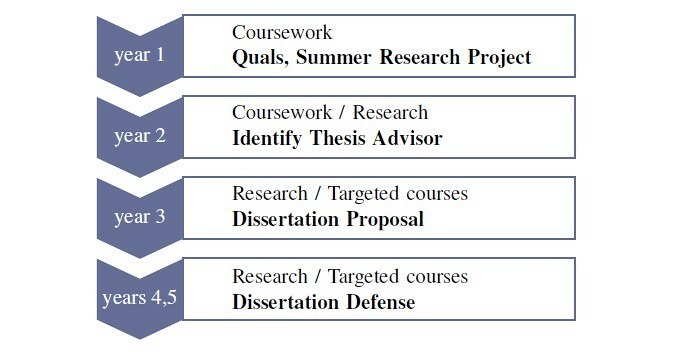 The following diagram provides a high level progress map of the PhD program. In particular, students take their qualifying exams at the end of the fist year, and start transitioning from coursework to research during the summer of their first year. Subsequently, students start focusing more on research, while taking elective courses. The DRO qualifying exam consists of two parts: the “stochastic modeling" and the “deterministic optimization” exam. These take place 1 week apart, typically the last two Fridays of May of a student’s 1st year. Students that fail one or two of the exams may be given a second chance at the end of their second year in the program to pass the respective exam(s) that they did not pass. Students are required to do a research project under the supervision of a faculty advisor over the Summer of the first year of the program. Such a project could be a literature survey, the beginning of a research paper, a computational study, etc. The expectation is not that this project will necessarily lead to a publishable paper, but rather that the student gets actively engaged in research. The faculty advisor for that summer project need not end up being the dissertation advisor of the student. Submit a 5-10 page report on their research project to their summer project advisor and the division’s PhD coordinator. Present a 20 min summary of their project in the PhD brown bag seminar. Your thesis proposal must take place by June 30 of your 3rd year. Note: The following requirements are meant to serve as a divisional benchmark. Students should discuss with their primary research advisor the precise format which will be most productive for the student in question. In some cases, the research advisor may ask for more (or less) than what is outlined here. Schedule a 2-3 hour slot. Provide your committee with a 10-15 page document summarizing your thesis proposal at least 1-2 weeks before the proposal. The day of the proposal, you will present for roughly one hour your research achievements to date and plans going forward. The presentation will be followed by questions. Following the proposal, you should think about how the feedback can help you execute your research plan.